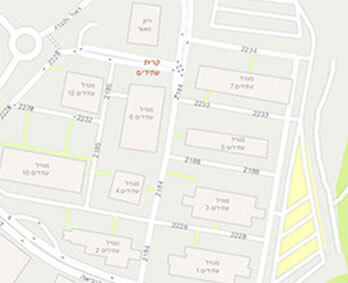 Kiryat Atidim is located at the heart of the Ramat Hahayal industrial area at Tel Aviv's north east, and is easily accessed from all nearby cities and the Sharon region. Each of the buildings, office towers and rented spaces is accessible from both entrances to the park – the northern entrance and the southern entrance. Parking is convenient and abundant. Regular bus transportation from Tel Aviv and the nearby cities to the gates of Kiryat Atidim. Showers are available for employees at Kiryat Atidim. Bicycle parking and Tel-O-Fun parking services. Kiryat Atidim is located at a short distance from two train stations: the Tel Aviv University Station and the Bnei Brak Station. High frequency bus lines operate to and from these stations. Designated parking spaces and accessible path to buildings.